Starting today, pre-paid carrier Cricket is offering the 6-inch ZTE Grand X Max 2 for a price of $199.99. The phablet is available from Cricket's online website and its retail locations. The 6-inch display carries a 1080 x 1920 FHD resolution. Under the hood is an octa-core 1.5GHz CPU, with 2GB of RAM and 16GB of internal storage. On back is a dual camera setup (13MP with auto-focus and 2MP with fixed-focus) with a 5MP front-facing camera ready to snap selfies and handle video chats. Android 6.0 is pre-installed. A 64GB capacity microSD slot is can be accessed by those seeking additional memory, and a large 3400mAh battery allows users to walk right past power outlets. Quick Charge 2.0 will take your battery from 0% to 50% in 30 minutes. Cricket is also offering some accessories for the Grand X Max 2. An InvisableSHIELD screen protector is priced at $14.99. $29.99 buys you a wallet folio for the device, and a PC Shield case can be yours for $19.99. Cricket's smartphone plans start as low as $35 a month using Auto Pay. Currently, you can pay $65 a month with Auto Pay and receive unlimited talk, unlimited text and unlimited high-speed data. There is no law that says pre-paid subscribers can't use a 6-inch phablet, and if you happen to be a Cricket customer, you can pick up the ZTE Grand X Max 2 for a reasonable price. If interested click on the sourcelink. Wow that seems pretty decent for $199. Well done ZTE. Looks like a good value device, just curious how that "octa core" would perform compared to a OnePlus One. If better, then it's another great bang for buck device for a different folk, if worse, I'll still highly recommend OnePlus One over it. Due to 3GB RAM (instead of the meh 2), 64GB internal Storage (instead of the meh 16GB), and 5MP front-facing camera (instead of meh 2MP). Basically, greater banger for buck. 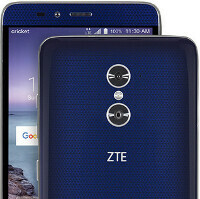 "64GB internal Storage (instead of the meh 16GB)" The ZTE has a microsd slot so that's a plus it has going for it. That seems pretty good for $199. How is ZTE on updates? Zte is lousy on updates. My Grand X max+ that I use solely for WiFi gaming is still running kitkat....but. Must add, zte makes very dependable phones. Ca51no, you do realize that there is an update for lollipop on ZTE's support page for the Grand X Max+.